Osteopaths are nationally recognised allied health practitioners who undertake a 3 year undergraduate Clinical Sciences Degree followed by a two year Masters Degree in Osteopathy. 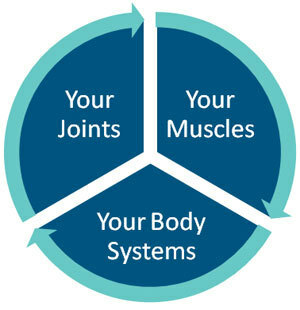 As holistic practitioners, osteopaths look at how the skeleton, muscles, joints, nerves, circulation, connective tissue and internal organs function as a complete unit. Osteopaths examine the neuromuscular system for muscle symmetry, co-ordination, postural control and gait patterns and look for any skeletal anomalies that can affect biomechanics leading to compensations elsewhere in the body causing dysfunction or pain. We take into account medication use, diagnosed conditions, prior surgery, previous injury, level of fitness and psychological wellbeing in formulating our treatment plans, and we perform various simple non-invasive orthopaedic tests and standard medical examinations of the musculoskeletal, cardiovascular, respiratory and nervous systems to assist in reaching a diagnosis. As holistic practitioners, we work closely with other health practitioners to provide you with the best overall care. You do not need a referral to see an osteopath. Osteopathy is covered by most private health insurers and the Medicare Chronic Disease Management Scheme. All osteopathic treatments are performed in a safe and controlled way using hands-on techniques to influence the body's structure and function. Techniques used can vary from person to person depending on the nature of the condition being treated and unique individual factors. Deep tissue massage and myofascial techniques to encourage muscle relaxation. Stretching of muscles and their periarticular structures to stimulate circulation and relieve congestion. Passive joint articulation and rhythmic traction to promote fluid circulation to joints, tendons & ligaments and improve joint range of movement. Spinal manipulation to improve joint nutrition and release restrictions to restore joint mechanics. Functional/indirect/counterstrain techniques to assist with the re-setting of neural control.